There's no doubt about it: College is stressful. Managing stress in healthy ways is key to being a successful student, and outdoor exercise is one of the best stress relievers. Most skiing and snowboarding enthusiasts want quality slopes close at hand, both for recreation and for when school pressures are high. If you're set on being close to great skiing and snowboarding during college, you may want to find a school within one of the three major U.S. ski regions. First, there's the Northeast, which includes New England and the northern parts of New York state. Then, you have what's known as the Mountain West, which begins in the Rocky Mountains of Montana and Idaho and continues to New Mexico. Then there's the Pacific Northwest, whose stunning mountain scenery runs along the coast from northern California to the Canada border. Other geographic pockets also offer quality slopes. This guide introduces 20 schools with a lot to offer snowsport aficionados. Utah boasts some of the country's best skiing, and the state is legendary for the quality of its powder. The U is based in Salt Lake City, and alumni include Winter X Games gold medalists Grete Eliassen and Tom Wallisch. The breathtaking landscapes and fantastic hills of the Snowbird Ski and Summer Resort are just 16 miles from campus, and 10 resorts exist within a 100-mile radius. Just under 32,000 students attend this state university, meaning new students should have little trouble meeting other ski and snowboard enthusiasts with whom to share rides and hit the slopes. In addition to highly regarded business, education, engineering, medicine, and law programs, the U boasts nationally competitive alpine and Nordic skiing teams. Boulder is well known as one of America's most progressive and health-conscious cities. Students looking for a more laid-back alternative to the University of Utah may look into CU Boulder. These schools are neck and neck among the country's best skiing and snowboarding colleges. In addition to being one Colorado's top colleges for academics, CU Boulder is within 100 miles of eight amazing ski areas. Eldora Mountain is closest at just 20 miles from campus. Between November and April, students take advantage of inexpensive shuttle buses that link campus to nearby ski destinations. Students may also join winter sports clubs or try to crack the school's top-performing Nordic and alpine skiing teams. Within about an hour's drive of Burlington-based UVM is a dazzling lineup of world class resorts and ski areas. These include Bolton Valley, Jay Peak, Mad River Glen, Smuggler's Notch, Stowe, and Sugarbush. Twenty-five miles from campus, cross-country skiers may also tackle the 300-mile Catamount Trail, which runs through the heart of the state. Burlington is Vermont's most populous city and a thriving cultural center. A historic school founded in 1791, UVM has highly regarded academic programs and a beautiful campus. It is also home to the UVM ski and snowboard club, which organizes winter sports events, offers ski pass discounts, and facilitates student trips to nearby slopes. Dartmouth is the lone Ivy League institution on this list. Its presence in that elite group of private universities speaks volumes about its academic quality. The New Hampshire school owns the 100-acre Dartmouth Skiway. Skiers of all skill levels may take a shuttle bus from Dartmouth's historic campus to this winter recreation area. Students may also head to renowned ski destinations such as Attitash, Killington, and Okemo. The school has a thriving winter sports culture and strong connections to nationally competitive programs. Alumni include more than 100 All-American skiers and more than 30 national skiing champions. Dartmouth swept the 2018 NCAA men's slalom championships, producing the individual winners of the slalom and giant slalom events. Even more impressive are the 120-odd Winter Olympics competitors who have attended Dartmouth, many of whom trained on the Dartmouth Skiway. It isn't hard to see why, in 2020, MSU will host the NCAA Skiing Championships for the seventh time. MSU is one of the most storied ski schools in the U.S., counting 13 national champions among its alumni. Nearby ski and snowboard destinations including Big Sky, Bohart Ranch, and Bridger Bowl are affiliated with the school. Bridger holds particular appeal for advanced skiers wanting to test their skills. MSU offers 51 undergraduate degrees, 41 master's programs, and 18 Ph.D. programs. Based in Bozeman, Montana, the school is an outdoorsy student's paradise. During the skiing off-season, athletes can stay in top form by mountain biking, hiking, or kayaking near campus. SNC is nestled in the mountains near Lake Tahoe, just two miles from the nearest ski resort. 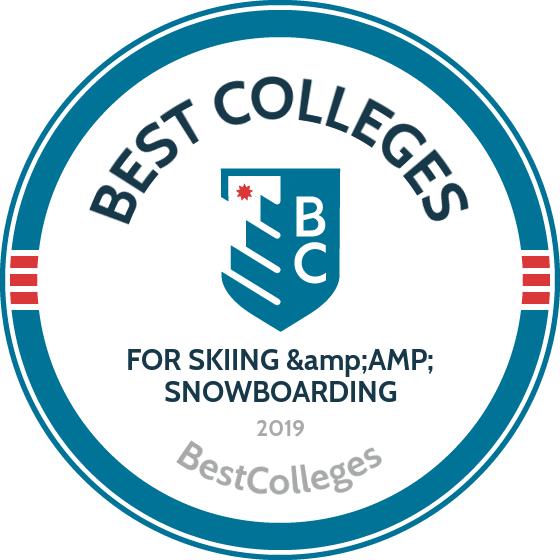 This tiny liberal arts college sits within 100 miles of 14 ski areas and is a competitive powerhouse on the United States Collegiate Ski and Snowboard Association circuit. Some students also explore the slopes in the classroom through SNC's four-year ski business and resort management program. The school's student body totals just over 1,000. Like the University of Utah, Westminster College is in the snow sport hotbed of Salt Lake City. However, it is a much smaller school. Students enjoy access to the same skiing and snowboarding opportunities while benefiting from small classes and a close-knit campus community. Westminster has a 9:1 student to faculty ratio, much lower than the national average of 14:1. The school consistently ranks in the nation's top 10% of private colleges, and it is Utah's only nondenominational private liberal arts college. Located in Bellingham, which lies in the Puget Sound region, WWU provides easy access to incredible skiing and snowboarding destinations. The North Cascades are about an hour's drive east of the WWU campus. Mount Baker, the 28th most prominent peak in North America, is the best known of the region's many ski areas. It is surrounded by some of the country's most dramatic alpine scenery. WWU is an excellent option for students who enjoy outdoor recreation year-round. The Bellingham area is a hiking, cycling, and sailing paradise. For students craving metropolitan adventure, Seattle's big-city lights are only about 80 miles away. WWU offers some of the Pacific Northwest's best graduate programs. It also boasts a private collection of sculptures crafted by world-renowned artists. The school offers an excellent mix of culture, academics, and natural beauty, making it a top-ranked Pacific coast ski and snowboarding school. Considering its small size, New Hampshire's PSU is an NCAA winter sports powerhouse. The school's skiing teams have met with repeated success on the competitive circuit, thanks in part to their affiliation with the Waterville Valley Resort. PSU's varsity skiing athletes train at the resort, which is a short drive away in the White Mountain National Forest. PSU is also a noted academic innovator. In 2017, the university introduced a novel organizational model by replacing its traditional academic departments with seven interdisciplinary faculties. Business and education are among PSU's leading study areas. Other acclaimed programs include communications, fine arts, health and physical education, and psychology. Plymouth itself is a cozy, historic town founded in 1763. Students craving a taste of the city can easily road trip to nearby metropolitan centers including Boston and Montreal. Middlebury is Vermont's oldest continuously operating higher education institution. Known for its close-knit community and quality academics, Middlebury also owns and operates its own ski area. The school offers students inexpensive day passes and free transportation to and from the ski hill. The college also offers flexible scheduling options in January, allowing students to temporarily lower their course loads and make the most of ski season. Middlebury has long prioritized equality and inclusion. It was one of the first New England colleges to accept female students, with women joining the student body in 1883. Middlebury consistently receives high national rankings among liberal arts colleges. Established in 1864, DU has long been one of the region's leading private independent colleges. Its campus sits about five miles from downtown Denver, putting big city excitement within easy reach. The university ski bus makes it easy for students to access several major resorts nearby. This is just one example of the school's commitment to promoting active lifestyles. DU's ski teams have won a record 24 NCAA titles, including 10 championships since the turn of the century. It has also produced a remarkable number of Olympic athletes, including alpine skiing legend Suzy "Chapstick" Chafee. Nevada offers easy access to Mount Rose Ski Tahoe, a leading resort that receives an average annual snowfall of 350 inches and soars almost 8,300 feet into the sky. While Mount Rose Ski Tahoe offers slopes for skiers of all skill levels, its steep hills draw advanced athletes. The resort recently reopened the infamous "Chutes" run after a decades-long closure. With inclines as sharp as 55 degrees, the Chutes will challenge even the most experienced skiers. There are also many other ski areas and resorts near campus, as Nevada is one of the West's top ski destinations. Academically, Nevada has a solid reputation. It is especially acclaimed for its schools of medicine and journalism, the latter of which has produced six Pulitzer Prize winners. Based in Canton, New York, St. Lawrence is on the northern frontier of the Adirondack Mountains. This puts it within easy reach of world class outdoor recreation areas including Lake Placid and Adirondack Park. Lake Placid is best known as the 1980 Winter Olympics venue, and Adirondack Park boasts more than six million acres of unspoiled natural beauty. The park's stunning mountain ridges rise to some of the Northeast's loftiest elevations, and the area's many ski resorts offer conditions comparable to those of the country's most famous destinations. St. Lawrence has a great academic reputation, with high national rankings among liberal arts colleges. Students can choose from 40 majors and 32 minors, and the college maintains partnerships with neighboring schools including Clarkson University and the State University of New York. Due to its remote location, Alaska is often overlooked in skiing and snowboarding discussions. This is a shame, since America's last frontier boasts some of the country's best winter recreation conditions. Alyeska Resort is UAA's closest ski resort. Forty-two miles from campus, it is home to about 1,400 acres of ski hills. Alyeska sees 650 inches of snow each year on average, and its ski season can last six months. UAA students also enjoy easy access to several smaller ski areas, including Arctic Ski Valley and Hilltop Ski Area, both of which are just a few minutes' drive from central Anchorage. These facilities are excellent for beginning and intermediate skiers, while advanced athletes and daredevils may indulge in extreme sports such as heli-skiing and backcountry skiing. Located in the Rocky Mountain foothills of Colorado Springs, CC is an excellent choice for students who want an intimate, community-oriented college experience. This private liberal arts college has a student body of just over 2,000 and is well known for its progressive approach to education. In 2018, U.S. News & World Report gave CC the top spot in its ranking of the country's most innovative liberal arts schools. CC is close to the state's most storied outdoor recreation destinations, including Vail, Breckenridge, and Keystone. Students can take advantage of convenient bus services to and from local ski areas, and competitive athletes may join one of the school's renowned club ski teams. CC is well known for its outdoor recreation culture, and new students should have no trouble meeting other ski and snowboard enthusiasts. Historic UNH boasts an outstanding lineup of outdoor adventure and recreation programs, thanks in large part to its prime location on the Atlantic coast. In addition to maintaining a Nordic cross-country skiing club, UNH students organize outdoor trips each semester. Winter trips include downhill skiing, snowboarding, cross-country skiing, and snow riding. The school's nationally competitive ski teams are perennial contenders for NCAA championships. UNH is the state's leading public research university, and its 15,000 students enjoy one of the nation's safest and greenest campuses. Undergraduate students may choose between more than 100 majors. Thanks to its coastal location, UNH has earned particular esteem for its oceanography and marine biology programs. Mines is based in Golden, Colorado, near ski locales including Echo Mountain and Eldora Mountain Resort. Students are also within a two-hour drive of the country's largest ski areas. Mines is home to an excellent coed club ski team, which participates in racing and slalom events every season. The school's specialized programs in mining and mineral engineering consistently receive high rankings internationally, and graduates enjoy some of the highest average early-career salaries of any school on this list. Mines also offers leading programs in numerous other applied sciences. Situated at the foot of Montana's iconic Mount Sentinel, UM is just seven miles from the Snowbowl ski area. This facility reaches a maximum elevation of 7,500 feet and has a skiable area of 950 acres. The longest of its 39 runs extends for three miles, and its West Bowl is a must for expert skiers seeking a challenge. Dramatic landscapes encircle UM's scenic campus. The school offers a wealth of outdoor recreation opportunities beyond skiing and snowboarding. Yellowstone National Park and Glacier National Park are both nearby. UM is particularly renowned for its conservation, forestry, wildlife biology, and ecosystem science programs. Best known for its highly successful NCAA men's basketball team, Spokane, Washington's Gonzaga is also an excellent choice for skiers and snowboarders. Located in a stunning inland setting near the Montana border, Gonzaga is just a stone's throw from Mount Spokane Ski and Snowboard Park. Many recreationalists consider this one of the Pacific Northwest's best resorts. Mount Spokane visitors of all skill levels can choose from 45 runs. The Gonzaga Ski Club is one of the school's most prominent athletic organizations, and students frequent several local ski areas in addition to Mount Spokane. Options include tree-lined 49 Degrees North, the 73-trail Silver Mountain, and the dramatic vertical drops of Schweitzer Mountain Resort. Academically, Gonzaga has a strong liberal arts focus, offering 92 undergraduate majors and 26 graduate programs. A highly regarded private research university known for its strong entrepreneurship focus, Clarkson sits in northern New York, west of the soaring Adirondack Mountains. In addition to an active ski club, which hosts organized trips to popular ski destinations throughout the Northeast, Clarkson's Nordic and alpine ski teams frequently compete for NCAA titles. The closest major ski spot is the Whiteface Mountain Ski Area, which boasts 87 runs and a serene alpine setting near the shores of Lake Placid. Whiteface is well known for its long ski season, which is usually well underway by Thanksgiving and often extends into April. Off the slopes, undergraduate students have access to more than 50 majors and minors. The school is a national leader in advanced materials processing technology training, and many graduates earn early-career salaries that are well above average. BestColleges.com has compiled a list of America's best colleges for skiing and snowboarding. Proximity to ski resorts was a critical factor in each school's ranking. Of course, you're at school to learn, so we also evaluated each college's reputation and academic quality in equal measure. Finally, we considered various lifestyle aspects of the school's location, because there's more to life than studying and skiing – even for the most dedicated students and snow sport fanatics.